Shimla, Feb 13 (IANS) Moderate to heavy snowfall may occur across Himachal Pradesh for the next three days, the Met Office said on Wednesday. Residents and tourists have been advised not to venture in the high hills. High hills of Shimla, Kullu, Sirmaur, Chamba, Lahaul and Spiti and Kinnaur districts are likely to experience "fairly widespread to widespread" snowfall, while hailstorm is likely in the low hills from February 14 to 15, an official of the meteorological office here told IANS. He said the western disturbances -- storm systems originating from the Caspian Sea and moving across the Afghanistan-Pakistan region -- are likely to remain active in the region till February 16. Most of the prominent tourist towns like Shimla, Narkanda, Kufri, Kalpa, Dalhousie and Manali are likely to have light to moderate spells of snowfall, he added. Keylong in Lahaul and Spiti district was the coldest place in the state with a low of minus seven degree Celsius. 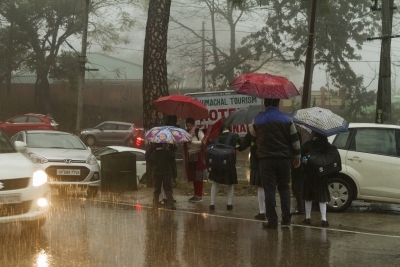 Shimla recorded the minimum temperature at 8.5 degrees, while it was minus 2.6 degree in Kalpa in Kinnaur district, 2.6 degrees in Manali, 6.3 degrees in Dalhousie and 4.8 degrees at Dharamsala. Kalpa saw mild snowfall in the past 24 hours.